My words are not just used megabytes, floating in a surreal space, but a part of my heart and soul.. I am Destiny's child, My Master's angel, Venusian, Meditator, Gourmet-Chef in the making! Books = Best Friends, Student & Practitioner of Cranio-sacral therapy. The Bible says, “Eve was created from a bone taken out of the rib-cage of Adam…” and according to Hindu Mythology, both Manu and Shatrupa emerged on their own from the body of Brahma thus, there is an Equality of Sexes…and hence all my life, I have heard my teachers and parents teach me that “God made it a point not to create woman from the bones of the feet of Adam, or from any tissue on his head”…thus interpreting…that God did not want women to be dominated by men nor did HE want women to be above men…instead, he created Shatrupa or Eve in equality or parallel to Manu or Adam…to be by his side and walk equally with him….side by side. It’s that day of the year again, where we count and recount, collect and recollect all sacrifices, efforts, patience and fortitude, the women in our life have put in forming us. Is that what we are saluting??? Or are we just creating an inequality ourselves, by booing and shooing the men thus creating an automatic salutation! Our celebration of womanhood in most cases, if not all, is done by comparing the successes and achievements with the opposite gender. Why? 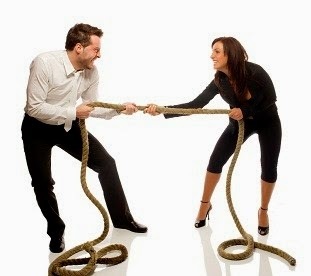 Is that really “healthy competition”, or are we trying to bridge the gap or is it creating an even bigger rift? Me thinks this complete gender discourse should not be about ascertaining equality or inequality. Women are just special…Like Mother Nature…there’s no beating that. Period. And Men, they are the best thing that could ever happen to us…If a woman is a Dream, the Man is the Power to make it come true.. or vice versa..Their completeness rests in their co-existence. A very feminist friend of mine once remarked, “some of us women are becoming the men we wanted to marry”……women, do think about this one…I am sure you will strike a chord ….and Men, see where we are getting to?? The sooner we realise and understand the essence, meaning and reasons of our creation the better it would be…Our Future lies not in fighting for Equality, it rests in understanding and celebrating our differences. So the battle of the sexes continues, the humour continues and the inequality (in good humour)…continues too. To all my male buddies….try to be good to her, all days of your life…forget treating her equally, just treat her real. Happy human’s day. To all the women in my life..who’ve loved me, held me, inspired me, dealt with me, nurtured me, pampered me, coaxed me and criticised me, encouraged me and driven me, all those who’ve prayed for me and stood by me…to all those women….!! Happy woman’s day!!! Btw.. the International Men’s day is celebrated on the 19 Nov…Thank your stars, men are bad with dates! :p !! I was wondering why such fantastic blog and this article in particular is having no comments, you are among few rare ones who talk about balance, appreciate that a lot. You touched very sensitive issue and i am sure, most of your female friends must not have read it ;), also delighted that you care to mention International men's day. Its true we are bad with dates, but point is no one really cares, we don't care and others also do not care!! In real life of an individual married couple difference thought and approach is but natural!Dominance of oneself to another is not an issue of ones existence but it is duty of both the individuals to persuade in real term the objectivity of their co existence.Jai guru Dev. I don't know how I missed your comment Ved. Thank you for your review & appreciation. Jai Gurudev!